(Newser) – The UN General Assembly gave Syria a fierce, albeit entirely symbolic, rebuke today for the violent crackdown on dissent that has plunged the country into a civil war. The Assembly voted 133-12 in favor of a resolution condemning the violence, with 31 abstaining, the AP reports. "The conflict in Syria is a test of everything this organization stands for," Ban Ki-Moon said. Referencing the current fighting in Aleppo, he added, "The acts of brutality that are being reported may constitute crimes against humanity or war crimes." what a super good lol!!!!!!!!!!! un to syria bad bad bad syria stop this now. if you dont you get a 10 day time out with no food. bad bad bad go to your room. bad bad! 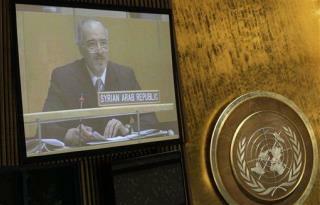 syria to un ha ha!!!!!!!!!!!!!!!!!!!!!!!!!!!!!!!!!! BOOM! UN always has been a joke. Close it down. Basher Assad is getting close to being booted out of the country. Next step after that? War crimes trials.